Now that Phase 1 (the purchase of the Hall waterfront property) is complete, people keep asking us – what’s next? Does this mean the gate is coming down at the end of the trail? The answer to the second question is, not yet. The Hall family property stopped short of the gate. Beyond the gate is private property and Black Rock, which is also private and heavily contaminated with heavy metals. The fact that the property beyond the gate is private, and that Black Rock is officially a Brownfield site that needs remediation, means that trail users need to turn around at the gate. Master Trail and Interpretive Plan: We were fortunate to secure funding to hire a consultant to put together a Master Trail Plan and an Interpretive Plan for the trail. These plans will help guide any future improvements to the trail, including signage, amenities and how to tell our natural and cultural history stories along this linear outdoor classroom. The plans will also help raise funds for those improvements. The planning began in the fall of 2014, and this spring we’ll see the initial proposed designs and plans from Harmony Engineering and Design and interpretive planner, Jane Rohling. Our Ales and Trails event, from 5:30 to 7:30 p.m. Tuesday, March 24, at Laughing Dog Brewery, will give folks an opportunity to weigh in on the designs for the trail. Brownfields cleanup: The Idaho Department of Environmental Quality is working with the city of Ponderay and the Black Rock property owner to enroll contaminated properties in the state’s voluntary cleanup program. Once the properties are enrolled in the program, cleanup alternatives will be determined and funding secured to remove the contaminated materials from the site, or to safely contain those materials in an onsite repository. Lakeside Neighborhood Plan: The city of Ponderay secured funds to hire StreetPlans, a consulting firm, to come up with a “subarea” plan for the lakeshore and upland neighborhood in the vicinity of a possible underpass, or crossings, that would allow access from Ponderay to the lake and the Pend d’Oreille Bay Trail. The plans are conceptual in nature, but will guide a specific zoning code that allows for a certain type of development in that area. City Planner Erik Brubaker is trying to develop a plan that would allow for a gradual, organic development to occur, with multiple property owners, over time that would blend with the city’s existing neighborhoods. Underpass planning: We are working with the City of Ponderay, Idaho Department of Environmental Quality, the Trust for Public Land and URS/AECOM, an international engineering firm, to get a technical feasibility study conducted for two potential underpass/overpass locations for the Pend d’Oreille Bay Trail. It is our hope that this feasibility study will help secure the support of the railroad and future funding for an underpass. 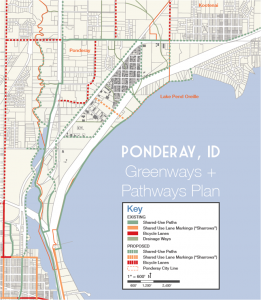 So, as you can see, while it may seem to be a quiet time for the Pend d’Oreille Bay Trail, much is happening to eventually connect this trail to Ponderay and to enhance the experience of users of the trail. We will continue to need the financial support of the community to keep these efforts moving forward. Our primary fundraiser is the annual Bay Trail Fun Run which takes place on June 7 this year. Please consider either participating as a sponsor, a runner or a volunteer! You can also give your input by completing this quick and easy survey! It’s actually very interesting with lots of wonderful archival photos and new design illustrations. Give us a hand and complete the survey before May 1!